With an objective to fulfil the demands of our clients, we are engaged in providing a wide array of 8 GB Bracelet Pen Drive. These Pen Drives are very popular among the youths. 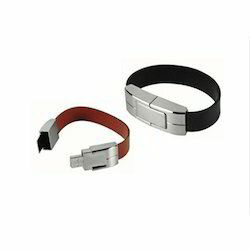 The Bracelet Pen Drive and Wristband Pen Drive are tie across wristband and can be printed with a logo as per the requirement of the customer. Flashbands With Your Logo Engraved. #Unlimited Colors. Personalized Bands Engraved with your logo. Guaranteed lowest wholesale pricing on branded promotional wristbands.